2017-2018 Annual Report is Available Now! New YC Video Click the HERE to watch! 2016-2017 Annual Report NOW Available! Yuma Catholic High School would like to welcome a new member to our Administration team! Sherryl Gerber will be taking on the role of Curriculum and Instruction Coordinator on June 1, 2017. Sherryl has been serving admirably in a volunteer capacity on our Curriculum, Planning and Outreach Committee. Her most recent post was with the Crane School District. 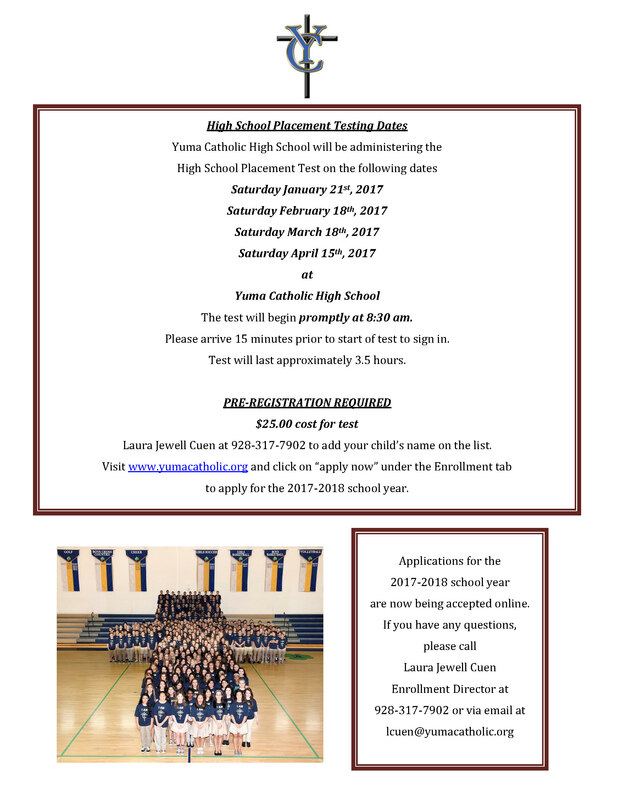 Yuma Catholic High School is committed to the rigor of a college preparatory curriculum benchmarked to the ACT College and Career Readiness Standards. Sherryl will analyze the student results data and work closely with the faculty and staff to enhance and promote student achievement. Spanish Club Giving Back at Christmas! Yuma Catholic Student’s Spirit of Giving Continues! 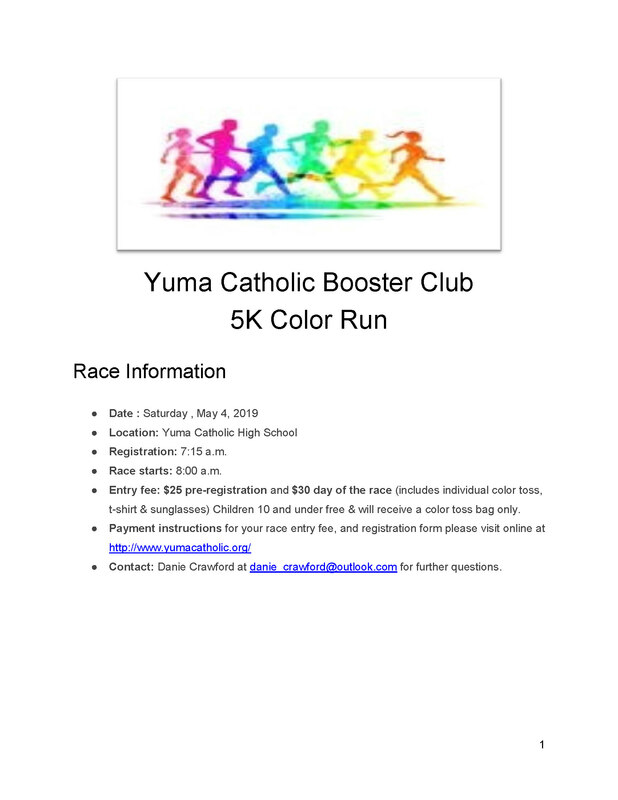 The Yuma Catholic High School campus and community promotes a commitment to give back and make our world better both locally and globally. The Yuma Catholic High School Spanish Club wants to improve the lives of children across the border. They chose to support the youth at the Bethel Orphanage in San Luis Rio Colorado, Mexico by donating clothing and toys. Principal Rhett Stallworth said, “I am very proud of our YC students. They continue to work diligently to give back to the community that has served them so well over the years. It is heartwarming to watch them grow and mature into young adults that are working very hard to become the next generation of community leaders." It has been a successful first half of the school year for YC campus student philanthropy. The students supported the Yuma Community Food Bank by donating funds and over 6,000lbs of food for the KECY Food Bowl High School challenge and took home the trophy. They are supporting the U.S. Marine Corps efforts in Toys for Tots. Over $600 was raised at the Rachel Determan Memorial Rib Cook Off and toys are being donated on campus as well. 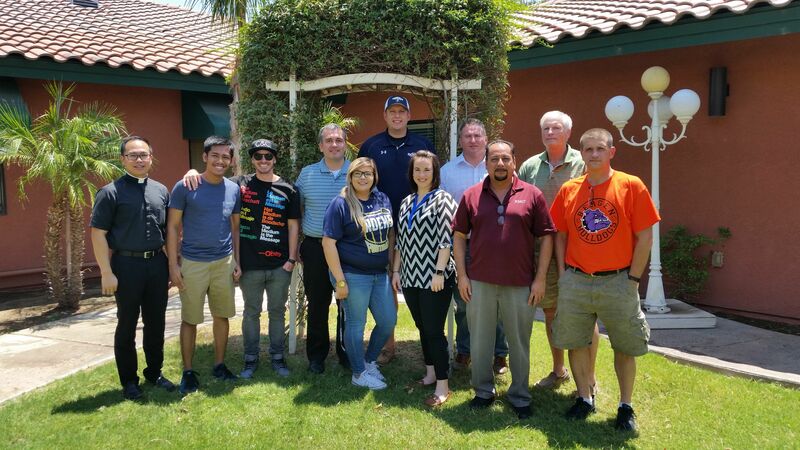 Yuma Catholic High School promotes a commitment to serve and make our community better. At one of our Friday spirit celebrations, the Engineering 102 Course decided to not just perform the YC Fight Song, but to also raise money for the Yuma Community Food Bank. Major Philip R. Nash, USMC (Retired) led his class in a rousing rendition at the end of Prayer. The students paid homage to their teacher’s favorite mode of dress by all wearing Hawaiian shirts just like Mr. Nash does every day! While they did not win the weekly competition, they were all winners by raising $500 for the Yuma Community Food Bank. Ms. Shara Merten, Director of the Yuma Community Food Bank, attended class with the Engineering students on Friday morning to accept the check and to chat with the students on their service. Welcoming all of our new faculty and staff!